Discounted price when you purchase in quantities of 50 & 100!! Great for many outdoor, gardening or storage needs! Puncture and tear-resistant woven bags provide protection from ultraviolet rays. 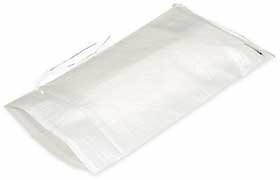 Bags make excellent sand-filled flood barriers and are suitable for heavy or over sized parts and supplies. They are super strong and have 200 hours of UV protection for many outdoor uses.